Kids Party in Melbourne, Melbourne Kids reptile party, reptiles party. kid's party ideas Melbourne, Melbourne's best party. A KIDS PARTY WITH SNAKEBUSTERS IS A KIDS PARTY TO REMEMBER! 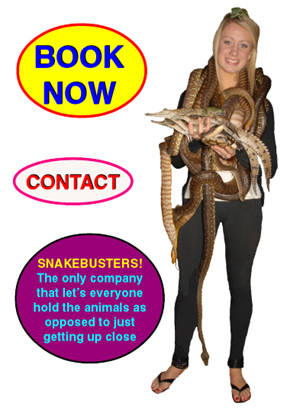 What makes a snakebusters kids party better than any other advertised "kids reptile party" in Melbourne? Our kids reptile party in Melbourne has the most "hands on"
We are Melbourne's most fun reptile party for kids! or, (see the link for all shows and party), but the main thing that people notice is that our kids party with reptiles is "full-on - hands-on" as in usually everyone holds pretty much everything - AND - without waiting. No other kids reptile party in Melbourne comes close! Deadly snakes that don't bite (another Snakebusters exclusive in Melbourne), harmless snakes, monster pythons, lizards, crocodiles, tortoises, frogs, a birthday gift that isn't junk, etc ... we bring the lot to our party! Pricing is usually $260 per kids party (Melbourne metro, 2009). Snakebusters are alone in Melbourne in not quoting surcharges for Crocodiles, no more dollars to bring the deadly snakes, not quoting extra for extra children above some miniscule number (no limit on kids at our party!) and free party invitations (see links here). Click here to download Snakebusters birthday party invitations.